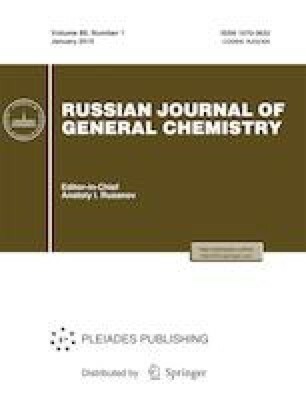 [4-(Diethylamino)phenyl]dichlorophosphine synthesized for the first time has reacted with trialkyl orthoformate and ethylene oxide in the presence of ethyl chloroacetate with the formation of phosphorylated formals and ethyl [4-(diethylamino)phenyl](2-chloroethoxy)phosphonyl acetate, a precursor of a new analog of nootropic drug KAPAKh. Russian Text © M.B. Gazizov, Sh.N. Ibragimov, O.D. Khairullina, S.Yu. Ivanova, K.S. Gazizova, R.A. Khairullin, Yu.S. Kirillina, A.L. Pistsova, 2019, published in Zhurnal Obshchei Khimii, 2019, Vol. 89, No. 1, pp. 73–77.